This will enhance security and customs processes as well as improve customer satisfaction. Some operators of Express Mail Service (EMS) have been trained on reducing obstacles on international transport for postal express service for documents and merchandise. This was during an EMS regional workshop on the transmission of advanced electronic data and the transport chain for Francophone Africa. 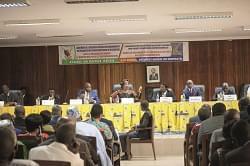 It brought together in Yaounde participants from Mauritania, Comoros, Niger, Morocco, Senegal and Cameroon. The three-day workshop which opened on Tuesday March 12, 2019, is organised under the aegis of the Universal Postal Union (UPU). While presiding over the official opening ceremony, the Secretary General in the Ministry of Posts and Telecommunications, Mohamadou Saoudi expressed satisfaction with the choice of Cameroon as host. He said the training will contribute to augment Cameroon’s efforts towards developing its digital economy. According to the EMS Regional Coordinator for Africa and Arab regions, Hamadou Ngam, the workshop is an opportunity for the EMS Cooperative to reach and train member operators on the topic of advanced electronic data. “Some of the objectives are to reduce obstacles in aviation international transport, enhance customs processes and improve customer satisfaction and loyalty,” he underscored. To improve end-to-end transport excellence, operators are expected to communicate advanced electronic data to customs authorities and receiving postal operators through the postal transmission of an electronic version of the customs declaration form. This quickens security and customs clearance. The Deputy General Manager of the Cameroon Postal Services, Lucien Nana Yomba said the training will help CAMPOST to give better quality services to its users. It is worth noting that EMS Cooperative is a body of the UPU and consists of over 180 postal operators who have agreed to work together and provide EMS– the fastest cross-border postal product. The outfit aims to promote cooperation between member countries so they can provide their customers with a high quality, competitive EMS service worldwide at an affordable price.